A distinctive blend of nutrients and botanicals that supports optimum cognitive function and memory enhancement. Ever experienced brain fog? That feeling of mental confusion or a lack of mental clarity? NuMedica Reminisce may help. It provides a unique blend of nutrients and botanicals (derived from plants) that can help clear the fog. Reminisce supports multiple pathways involved in neurological health. These include healthy oxidant and cytokine balance, mitochondrial function, endocrine balance and methylation. 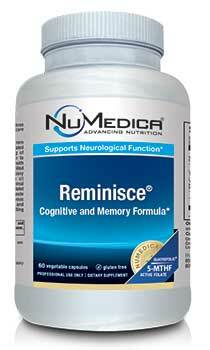 Reminisce includes 5-MTHF (Quatrefolic) which is the most biologically active form of folate. This helps the nutrients to be rapidly absorbed into the bloodstream. Reminisce includes Niacin (vitamin B3) which will help flush impurities from the body and support functions in the digestive system, skin and nervous system. In addition to NuMedica Reminisce, a nutritious diet of natural whole foods, plenty of water and proper sleep may also help improve cognitive function and help get the cobwebs out. Directions: Take two capsules daily with meals or as directed by your healthcare practitioner. Note: This formula contains niacin, which may cause temporary flushing. Other Ingredients: HPMC (vegetable capsule), vegetable stearate, MCC (microcrystalline cellulose), rice flour, ascorbyl palmitate, silica. Contains No: Wheat, gluten, corn protein, yeast, animal or dairy products, artificial colors, sweeteners or preservatives. Quatrefolic® 5-MTHF. Quatrefolic® is trademarked by Gnosis S.p.A. Patent No. 7,947,662. My last secret weapon against stress is: Strengthening and Stilling the Mind. You may think this is silly, or easy, or not a real weapon. But let me tell you, a clear head is one of the greatest possible weapons you can have to combat all kinds of stress.